ESTATE LOT BLOWOUT SALE. We have broken down this large collection into smaller lots which are now ready to be passed on to you at blowout prices! Every single item in these lots is guaranteed to be at least 50 + years old, each item is from before 1965. And the Graded Coin will be at least 20 years old. These lots are the. Best of The Best. Nothing comes close to the value you get with these lots. Now yours over 50% off. At Least 30 Premium Items In Every Lot. GOLD In Every Lot. At Least one full Ounce of 90% SILVER Coins In Every Lot. (Think of the possibilities). One PCGS Or NGC Graded Coin. (Two Best Grading companies in the World, not cheap). One Rare Type Coin Over 150+ Years Old. At Least Ten (10) coins over 100+ years old. All from before 1915. At Least One Piece Of Large Size Currency. Over 90 years old. At Least One 100+ Year Old SILVER Coin. At Least Two (2) Pieces Of Obsolete Small Size Currency. (Includes Iconic Silver Certificates and Red Seal Notes). At Least One Coin Minted During World War 2. Made from emergency metals, neat! At Least One Coin Minted During World War 1. 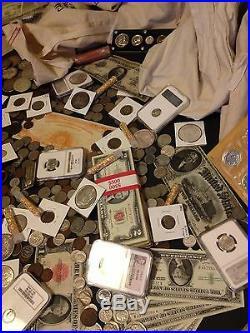 WE GUARANTEE YOU WILL LOVE YOUR LOT OF COINS , GOLD , AND CURRENCY! No other listing offers at least 30+ items in each of their estate lots. 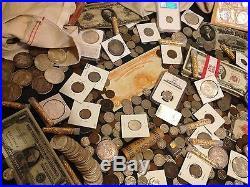 Nor does anyone else guarantee a full Ounce of 90% silver coins in each lot, or a scarce type coin over 150+ years old. No other listings guarantees at least 10 coins 100+ years old or a piece of Large size currency. This is also the only listing which guarantees coins from WWII, WWI, and A PCGS or NGC graded coin in each and every lot!! You will NOT receive everything shown in the pictures. Note that it costs around. To get just a single vintage coin graded at PCGS or NGC. So just that slabbed coin gives some nice added value to this lot. They are really fascinating! All of these items are US, no foreign at all! These lots make perfect starter collections, great gifts to family or friends, valuable items to sell at local flea markets or yard sales, or as reliable investments. I have never seen these coins go down in value, only up and up and up! This is a great way to own 30 fantastic pieces of history. So pick a few lots, You’ll be glad you did. ITEMS YOU MAY RECEIVE. Pre 1965 90% Silver Coins. Silver Certificates, Silver Proof Sets. Liberty V Nickels, Silver Bullion, Mint Sets, Commemoratives. Barber Dimes or Quarters, Jefferson Nickels, Old Banknotes, Large Vials Of Gold Flakes. Flying Eagle Cents, Rolls of Coins. Wheat Cents, Silver Bullion. Half Cents, Large Size Currency, 40% Silver Coin, Silver Dollars. And So Much MORE! This is by far the least expensive and highest quality listing like this out there, no one offers this variety of coins for the price. Our wholesale lots are a great way to escape always having to pay expensive retail prices. You are finally in the dealers position for a change. These lots are a great way to start a new collection, get fascinating pieces of history, have valuable product at flea markets or shows, trading material for other collectors or dealers, to add on to your collections, or as a reliable investment, the possibilities are endless. Take advantage of this rare deal, it is a great offer. Every lot is different , no two are alike, so don’t worry about getting coins from all the same years, we promise. We have even seen coins from the 1810’s in our available group! We have had so many happy customers and repeat buyers with our lots. This tells us that we have a great product for a great price. These lots are great! We have had so many happy repeat customers. Each lot is different, so we can’t guarantee this savings in every lot, but w. Don’t miss this opportunity! The coins in the picture are the coins you will receive!! These are NOT stock photos. What you see are the type of items you will get. 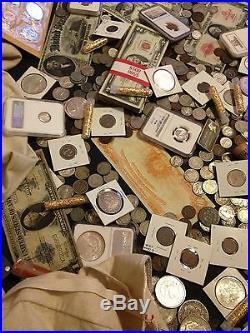 The coins and Bills are in circulated and uncirculated condition and are in nice overall condition for their age. The older coins and bills may have little problems here and there but the type and year will still be identifiable. Check Out Our Awesome Feedback On This Listing! Like opening a treasure chest straight out the mailbox A+. 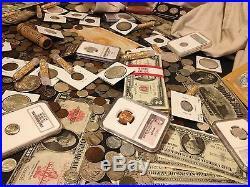 ESTATE SALE LOT OLD US COINSCURRENCYPCGS NGCGOLD SILVER BULLION50 YEARS+ (#271377554694). A great deal for the price. I would do business with again. Received what was promised and promptly. JeffsCoins is dedicated to offer you some of the. Thank you for all of your business and support! J effs C oins. Check out our other items. Be sure to add me to your favorites list. 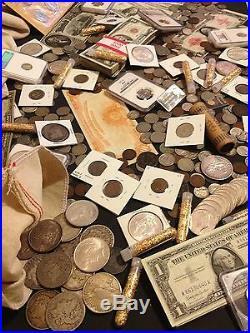 The item “ESTATE SALE LOT OLD US COINSCURRENCYPCGS NGCGOLD SILVER BULLION50 YEARS+” is in sale since Sunday, August 24, 2014. 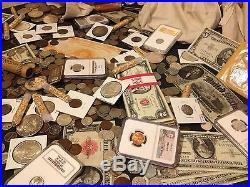 This item is in the category “Coins & Paper Money\Coins\ US\Collections, Lots”. The seller is “jeffscoins” and is located in Merrifield, Virginia. This item can be shipped to United States.